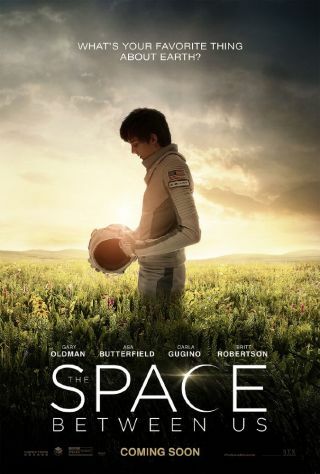 "The Space Between Us" (2017) features Asa Butterfield as a 16-year-old boy born on Mars who falls in love with someone on Earth (played by Britt Robertson). A new science fiction film, "The Space Between Us," hits theaters today (Feb. 3), and it just might be the most spaced-out teenage love story yet. Human missions to Mars have been a hot topic in space-themed science fiction stories for decades. "The Space Between Us" introduces a fresh take on this familiar plot, showing audiences a new kind of interplanetary adventure: a young Mars colonists' first trip to planet Earth. "The Space Between Us" tells the story of the first person born on the Red Planet, which happens after an astronaut discovers she's pregnant while en route to the Mars colony. In an effort to avoid a scandal, the fictional private spaceflight company in charge of the mission chooses to keep the baby a secret. Sixteen years later, the native Martian, named Gardner Elliot, takes his first trip to Earth. There, he hopes to find his father and win the heart of a girl named Tulsa, who he met online while living on Mars. The trip doesn't go quite as smoothly as planned, however. Tulsa refuses to believe that Gardner is from Mars, and the search for the boy's father turns into a nationwide police chase. To make matters much, much worse, Gardner's health rapidly declines as his body fights to adjust to a new world that has 62 percent more gravity than where he was born. This new environment makes his body weigh about three times more than it did on Mars. Because there is currently no way to know for sure how the human body would react to a situation like Gardner's, the film's producer Richard Lewis consulted several different medical experts, including cardiologists and flight surgeons, to come up with the most plausible scenario. The filmmakers clearly studied up on real-world space vehicles and concepts, featuring several of them in the movie. That includes NASA's new rocket, the Space Launch System (SLS), which is still in development and slated for launch in 2018. Dream Chaser, a shuttle-like spacecraft concept by Sierra Nevada Corporation, also appears in the film. In fact, the filmmakers had access to a real prototype of the Dream Chaser. In the movie, to get to Mars, an ascent vehicle launches aboard the SLS and docks at the Mars Transfer Vehicle (MTV), which looks like a cross between the International Space Station and Lockheed Martin's "Base Camp" concept. The MTV then goes on a six- to nine-month trip to Mars, where the vehicle remains in orbit after the astronauts ride a descent vehicle down to the planet's surface. Returning to Earth follows the same process. When humans ultimately do go to Mars, this may very well be the way they do it. Technology concepts aside, one thing that makes this movie stand out from other space films is its strong focus on human emotions and character development. In most space movies, "the focus tends to be on hardware and not so much the people, which makes this movie unique," Hubbard said. Even if teenage love stories aren't your style, this movie is worth checking out.